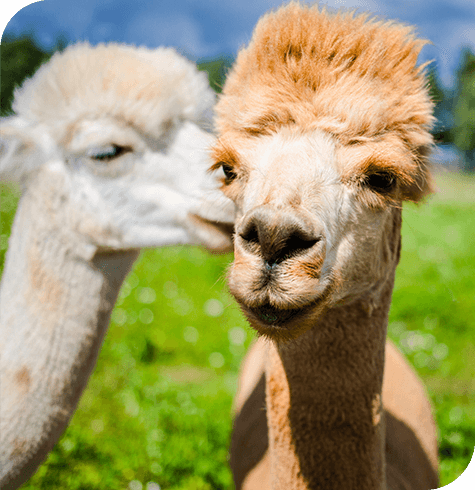 Britain is home to the largest population of Alpacas and Llamas in Europe, we therefore provide a broad range of services and understand the need to provide good quality veterinary care. Alpacas and Llamas are docile animals and pleasant when accustomed to being handled. They are normally kept at pasture all year round with access to shelter; they will happily live alongside sheep, cattle and horses. The animals are naturally herd based and therefore should not be kept in isolation, they may become aggressive and spit. An area of hard standing is desirable to assist wearing of the nails. Fresh drinking water should be available at all times, they are fastidious and will refuse to drink polluted water. Hay and grass should supply all their needs. If a rich diet is provided, this will lead to obesity, fertility problems and liver disease. At Aireworth Vets we offer a vaccination for clostridial disease. The gestation period for alpacas and llamas is 11-12 months. We are happy to discuss reproduction in both alpacas and llamas and our vets are on hand 24/7 should you require assistance throughout the pregnancy.